Above: Brendon Pressure washers and Powerwasher Accessories arriving in the Netherlands. Note the ‘cool’ purple of the Company livery! If you are in the UK and in urgent need of either a pressure washer or bowser washer from our stock, we aim for next day delivery, by 8.00 am, using our internal Brendon delivery staff – however, overseas delivery takes a little longer. We appreciate the need for a rapid and reliable response to Industry and especially to the Hire Industry! 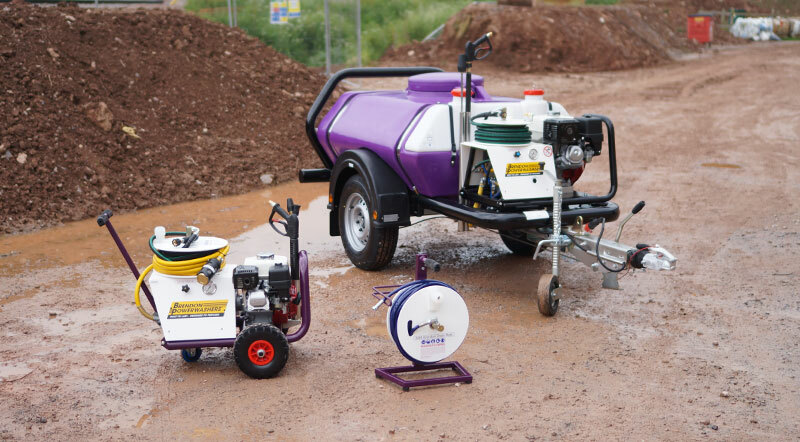 Self-contained pressure-washer trailers with powerwasher accessories which comprise jet washer; self-contained drain cleaning and pipe cleaning for up to 110 mm diameter. This combination is highly suitable for the Pressure-Washer hire and industrial cleaning industries. Other points to note: the onboard 950 ltr baffled water tank which prevents water surge during towing and which provides up to one hour’s pressure washing time; the unit is fully EU road legal. Also included in the Netherland’s delivery was a 20KPE petrol engined Portable Power Washer unit, which is ideal for professional use, domestic, horticultural and agricultural applications etc. The above model is only one of a wide range, which includes power washers up to 7000 PSI / 500 BAR. This specification makes the larger machine ideal for heavy industrial pressure washing.